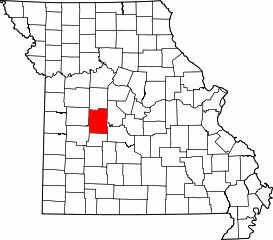 Benton County is a county located in west central Missouri in the United States. Its county seat is Warsaw. The county was organized January 3, 1835, and named for U.S. Senator Thomas Hart Benton of Missouri. Cemeteries of Benton County, Missouri are located across the county. Listed here are cemetery records that have been published online. According to the 2000 U.S. Census, Benton County has a total area of 752.48 square miles (1,948.9 km2), of which 705.51 square miles (1,827.3 km2) (or 93.76%) is land and 46.97 square miles (121.7 km2) (or 6.24%) is water. As of the census of 2000, there were 17,180 people, 7,420 households, and 5,179 families residing in Benton County.